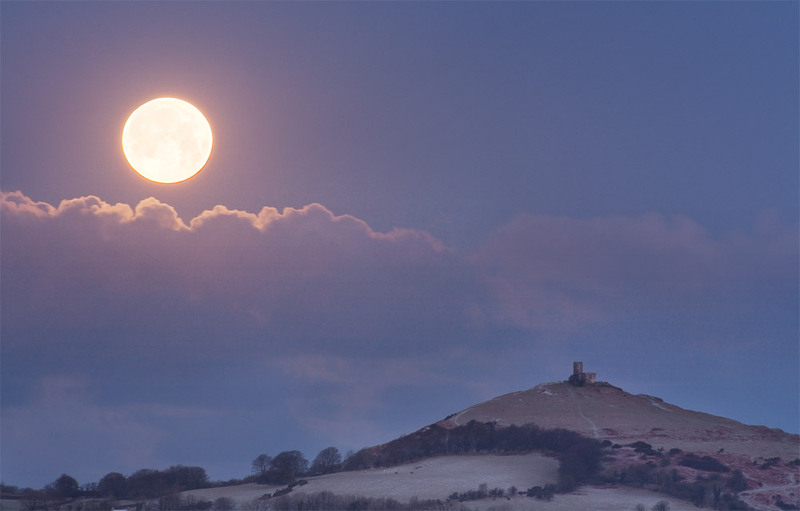 If you are the planning type of landscape photographer then you might be interested to know that the upcoming full moon is a ‘super moon’ and, for those of you who have ‘real jobs’ it also falls on a weekend! On Sunday the 26th of May the moon will be at perigee (meaning that it is at the closest point of its slightly elliptical orbit around earth) as a result the full moon on the Saturday will be 13% larger than normal. The difference is small but appreciable. If you are in the UK the moon will be rising in the south east and setting in the south west (opposite the sun). Around the time of full moon the moon will rise and set at a similar time to sunrise. You can shoot the full moon with any focal length, but if you really like a challenge try planning a telephoto landscape. The descriptions below assume that you have perfect clear skies, which looks a little unlikely in the UK! Friday evening: Sunset 9.10pm, Moonrise 8.31pm in the south east – By the time the sun sets the moon will already be at 4 degrees and no longer looking particularly yellow. The best shooting opportunities will be looking away from the sun from 15 minutes before sunset to about 30 minutes after. Since the moon will already be above the horizon at sunset it will be relatively easy to adjust your position to your subject (I am thinking of a distant subject here). This will be in marked difference to moonrise the following day, which will require almost perfect positioning right from the start if you want to shoot the moon at a 300-600mm focal length. 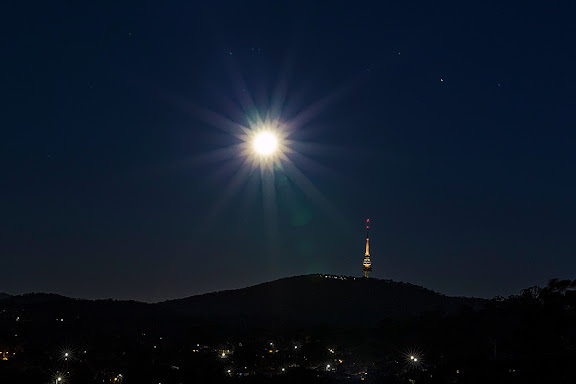 Saturday morning: Sunrise 5.15am, Moonset 05.31am in the south west – The moon will be 2 degrees above the horizon in the twilight just prior to sunrise (5.05am). I would say that the best shooting conditions will be a little before this. By sunrise the sky will be so bright and the moon so hidden behind haze that you probably wont be able to see it. I suggest being set up and ready to go by 4.45am at the latest. Moonsets are easier to handle than moonrises because you can predict the position the moon will wet in much more accurately based on its current position – it will move diagonally down to the right as you look at it. Saturday evening: Sunset 9.11pm, Moonrise 9.42pm in the south east – The moonrise is 30 minutes after sunset. By this point the sky will be a rich blue if you expose for the moon. If you wait for the moon to get higher in the sky then it will be unmanageably bright compared to the sky. Therefore you are best off with a clear view to the south-eastern horizon to give you a shot as the moon rises and this should create a beautiful colour contrast of orange moon against blue sky. Mountain ranges can make for dramatic foregrounds to shoot with the moon, although in this particular case I would have liked a bit more relief. With the moonrise and moonset in the SE and SW respectively you need to be pointing your camera in that direction! The longer the focal length you want to shoot with the moor precisely you will have to position yourself relative to your intended foreground subject. It is much much easier to get a moon image at 200mm than it is at 600mm, so if you doubt your technical ability and havent really planned a shot before, then it might be best to avoid the super telephoto lenses for now anyway. Silhouettes make great subjects for moon images, trees, stacks of rocks, isolated buildings and mountain ranges all make great subjects. Get your thinking cap on and see what you can come up with! Silhouettes make for perfect subjects to shoot with the moon, but they aren’t always easy to find and an image like this may take a lot of patience and planning. This was shot with my Canon 400mm 5.6L and a 1.4 II teleconverter. The image quality is pretty good, but I still would have loved a 600mm f4! 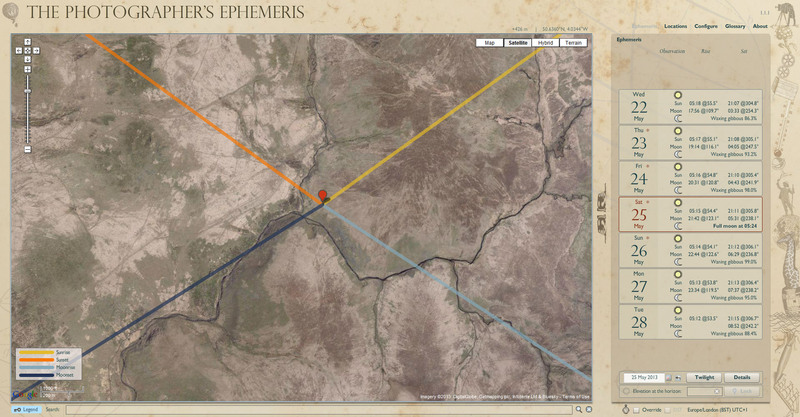 I suggest using ‘The Photographers Ephemeris‘ to plan your shots. This is available on PC, Android and IOS and it really is an essential piece of software for planning images like this (I used to read the information from a text file from an astronomical database so things have moved on a fair bit!). – Making your tripod as stable as possible and weighing it down if necessary by hanging something heavy from the center column (make sure it doesn’t swing in the wind! – Opening up the aperture to it’s widest setting to get a shorter shutter speed. If you’re feeling disappointed because you’ve just missed the great event….wait until this time next month when there is another super moon! Written by alexnail, posted on 21st May 2013 at 5:48 pm, in Tutorials and tagged astrophotography. Permalink. RSS feed for this post. Alex, a quick question if I may, what sort of asa / apature settings would you be using to shoot in moonlight? For super telephoto shots if there is a breeze you need to get a reasonable shutter speed. I would shoot at about ISO800 and ‘wide open’ at f8 (which is as low an f number as I can get with a 400 5.6 and 1.4x tc). Moon movement is also an issue, I would imagine a exposure time of a second would cause the moon to motion blur. My best advice is to try and see! Many thanks Alex, I will. I’m using a 70-300 Sigma on a 5D III , any further thought would be welcomed. Na, as per norm I made a bollux of it….